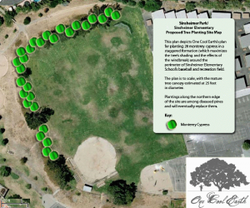 After 20 years, One Cool Earth has returned to Sinsheimer park and, with the help of Sierra Student Coalition and 350.org Day of Climate Action enthusiasts, has planted 50 live oaks to replace dead and dying Monterey pine trees surrounding the Sinsheimer elementary baseball field. Trees will serve as a windbreak and shade the school sports fields, as well as stabilize eroding slopes and improve wildlife habitat. The project was supported by the City of San Luis Obispo, and generous grants from Pacific Gas & Electric as well as the Glikbarg Foundation.